HB Signature Adonia Wall Mounted Traditional Heated Towel Rails. Central heating, Dual Fuel and Electric only options available for every size. Manufactured in accordance with BS EN 442. Supplied with wall mounting brackets and fixings. Dual Fuel Option Only: Element, T-Piece and Manual Valves. Electric Option Only: Element, Conversion Kit. Heat Output BTU (Delta T50). Heat Output BTU (Delta T60). Heat Output Watts(Delta T50). Heat Output Watts(Delta T60). Towel Rail Wall to Pipe Centres. If you love the style and glamour of a vintage bathroom then the Adonia wall mounted towel rail from the HB Signature range is the ideal choice. Combining a classic column radiator with a chunky chrome towel bar, this beautiful towel rail is the ideal practical and decorative touch alongside a traditional claw foot bath tub, creating a truly eye-catching feature in your Victorian or Bauhaus bathroom. Available in a choice of two sizes, the Adonia heated towel rail is manufactured from mild steel with a gorgeous white and mirror polished chrome finish. Steel has high thermal conductivity and will continue to radiate heat even when the heating system is powered down, making it extremely energy efficient. The HB Signature Adonia offers high heat outputs backed up by EN 442 certification and is available in dual fuel or central heating options or as a standalone electric radiator. Available in non-thermostatic and thermostatic options, with a full 5 year guarantee, the Adonia is as flexible as it is superbly stylish. Range of standard and thermostatic valves available separately. Central Heating, Dual Fuel or Electric only - Explained! Central Heating - A central heating Radiator or Towel Rail is heated using your central heating system. The most important part of this system - for your Radiator/Towel Rail - is the boiler, and you most likely have one in your kitchen or bathroom. Electric Only - An Electric Only Radiator or Towel Rail is filled with a heat conducting liquid, this could be oil, or a water based. Working with your home's electricity supply, with the benefit of not needing to be plumbed into your central heating system, a Thermostatic or Non-Thermostatic element is attached to the Radiator or towel rail and this is what controls its heat. You will need to have these Radiators/Towel Rails installed by a qualified Electrician. 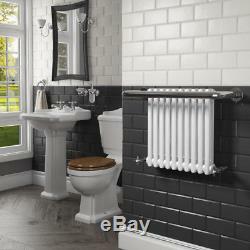 Dual Fuel - A Dual Fuel Radiator or Towel Rail is a combination of both the Central Heating and Electric Only versions. A Dual Fuel Radiator/Towel Rail is not filled with any liquid like the Electric Only, because it is made to be plumbed into your Central Heating System, which will be the source of its heat when the Central Heating System is turned on. When the Central Heating System of your house is turned off you can use an Electric Element (Thermostatic or Non-Thermostatic) to heat the Radiator/Towel Rail. Please allow extra time if you are paying by cheque. Or you can collect from us. This means that you do not have to wait in until your goods arrive. We therefore respectfully ask that you do not arrange for a plumber or other tradesperson to fit your goods until you have received and checked your order. We cannot be held responsible for wasted tradesperson visits and charges incurred as a result. SPECIAL ARRANGEMENTS FOR COURIER DELIVERIES. When your order arrives, you will be asked to sign to say that you have received the goods and that they are in good condition. Please check both the external packaging and the product inside for any damage. We will arrange for a replacement item to be delivered to you as soon as possible, at which time the damaged item will be collected and taken away by the driver. SPECIAL ARRANGEMENTS FOR PALLET DELIVERIES. If someone else is signing for the goods on your behalf, you agree to ensure that your nominated signatory checks the goods prior to acceptance. Choosing the right accessories for your new Radiator or Towel Rail. The type of valves that you need will depend on the configuration of your pipework. If the towel rail / radiator has connections at the bottom. You will need either angled or straight valves. Angled if your pipes are coming from the wall as this will provide a 90 degree angle up into the bottom of the towel rail / radiator, straight if your pipes are coming from the floor and just need to go straight up into the bottom of the towel rail / radiator. If the towel rail / radiator has connections at the sides. You will need either angled or corner valves, angled if your pipes are coming from the floor as this will provide a 90 degree angle into the side of the radiator. Corner Valves if your pipes are coming from the wall this will also give a 90 degree angle into the side of the radiator however is the neatest solution with this type of configuration. The item "Traditional Bathroom Towel Radiator Heated Wall Mounted Victorian Towel Rail" is in sale since Wednesday, October 24, 2018. This item is in the category "Home, Furniture & DIY\Bath\Towel Rails". The seller is "essentialshoppinguk" and is located in Colchester, Essex. This item can be shipped to United Kingdom.